I wrote the original review of this back in late August, and I just tweaked it a little. The true story of it all seems like it’s a sad one, but the Hollywood version turns it into a complete and total schmaltz-fest. It’s apparent that we’re supposed to relate or feel pity for the characters, but it proves difficult sometimes. The first half starts off on a fairly strong point with a nice little original wedding, the injury on account of lack of seatbelt, the amnesia bit. Then, the parents come in (Jessica Lange and Jurassic Park’s Sam Neill), wanting their baby girl home because she ran away a while ago. It soon turns into a total schmaltz fest, that, if you are unaware that it’s a true story, you might think it comes right out of the mind of Nicholas Sparks. At the half-way mark, it’s hard not to lose interest in the characters and the story itself and the hardest task is not to mimic the people in the film, much like I did with The Lucky One. The film just doesn’t get any better. The film isn’t entirely unendurable, but it’s a sub-par effort with lazy and predictable writing, that had the tendency to be too cute. The filmmakers probably feel having Channing Tatum and Rachel McAdams on board, their appeal would satisfy audiences, and there wouldn’t be a need for good writers. News flash: That doesn’t work, guys. The chemistry between McAdams and Tatum was likeable enough, even though there was a lot of very irritating fights. The film is part sad, part feel-good, but very average, with the best part being McAdams and Tatum. This is a lesser effort from co-screenwriter Guillermo del Toro (Hellboy, Pan’s Labyrinth), but hell – geniuses are allowed to mess up every now and then. The daughter, played well by up-and-comer Bailee Madison, has layers because she’s all hyped up on medications and she feels abandoned by her mother. Her father (Guy Pearce) thinks that she’s just the little girl that cried wolf when she says little things are after her. Katie Holmes plays the girlfriend who is trying to make a good impression, and tries her very hardest to communicate with her. Don’t Be Afraid of the Dark tries, it really does. The horror just isn’t good because there’s nasty teeth at times and there’s really only a few jump-scares. Sure, it can be creepy, but when the tiny villains are actually revealed – it becomes seriously laughable. I had a laughing fit at one point, it’s just so darn silly. The little things aren’t that threatening, probably because they’re just too CGI-animated and they come off as foolish. The characters really should just turn on a freaking light. Hint: when voices are calling to you from a vent, don’t answer. Idiots. The unrewarding film leads up to a questionable ending, that hardly makes sense. Tagline: Think fast. Look alive. Die hard. 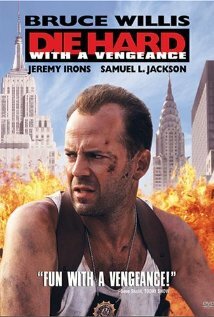 The plot: John McClane and a store owner must play a bomber’s deadly game as they race around New York while trying to stop him. This is actually a better sequel than the first, but not by that much. This has the ability to be equally intense and still quite funny. McLane has a new sidekick, Samuel L. Jackson who plays a racist shop owner. They make a really good team. I also appreciate the film going back to its “original” roots by bringing in a mastermind like Hans Gruber, his brother Simon (portrayed by Jeremy Irons). I enjoyed all the surprises that were thrown out there, and the one-liners are still stellar. 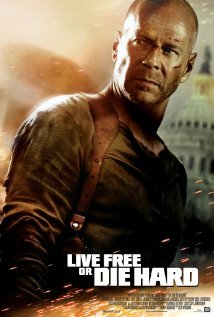 The plot: John McClane takes on an Internet-based terrorist organization who is systematically shutting down the United States. Currently, this is the weakest of the series (I haven’t seen the fifth), but that doesn’t mean it’s bad. At all. It’s really good and the idea of shutting down the United States is cool. There’s fun oozing out of this, and there are epic action scenes, even though one might have to accept a lack of realism at times. Strangely, Justin Long’s character can be a serious and extremely anxious, but you’d expect a comedian to be a bit more hilarious. Not a lot stands out about him in this. I have nothing but love for the guy in most his roles, but this one… It isn’t special. It isn’t the greatest idea on the studio’s behalf to cast a comedian as a character who’s hardly that funny or memorable. In fact, to date, he’s the most forgettable of the sidekicks that McLane has had. Though, Olyphant plays a solid villain. It’s a pretty stellar movie that’s really fun and flows well, but an R-rating may have made this a little better. 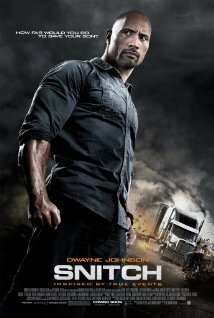 Snitch doesn’t seem like Dwayne Johnson’s usual action vehicle, because this one seems to have a moralistic edge with concepts of loyalty. It also seems like it has a good story, unlike 2010’s Faster. The story follows John Matthews, a father who goes undercover for the DEA in order to free his son who was imprisoned after being set up in a drug deal. It also has a true story appeal, however, Dwayne “The Rock” Johnson’s popularity isn’t huge. Hopefully having Barry Pepper, Susan Sarandon and Jon Bernthal (Shane on TV’s The Walking Dead) will attract audiences alike, even though there won’t be any zombies in this. Films similar to this usually open at $14.9 million, but this won’t open at that much since this is an action drama. His last main action vehicle, Faster, opened to $8.52 million, and for the opening weekend, he averages out at $27 million for fourteen films. Snitch should gross over Faster’s opening, but only by a few million. 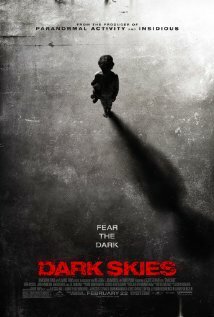 Dark Skies is the other big release opening this weekend at 2400 theaters. It is being marketed as being from the producers of Paranormal Activity and Insidious, two fairly well-liked films. It’s a haunting film, but with mythology and aliens instead… It could turn out to be a really cool flick, but it could also turn out to be just awful. The trailer seems promising, but it starts to get laughable, so it could just be unintentionally hilarious. I want to see it, it might be a good time. Might. There doesn’t seem to be a lot of star appeal, because the only person I know is in it is J.K. Simmons. This would be in good shape if it opened between The Covenant’s $8.6 million and The Reaping’s $10 million, but I’m not sure if it will. 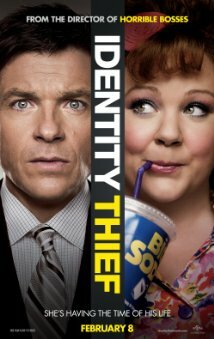 As a follow-up to the hilarious Horrible Bosses, Seth Gordon brings us Identity Thief, a film that isn’t the gut-buster everyone was expecting, but it is quite funny. Sandy Patterson (Jason Bateman) has a good life: a beautiful family, a decent job, and a silly name he swears to be unisex. He’s almost living the American dream. He is able to land a Vice President job at a new firm when he and a good majority of employees at his old one start a new company. Everything’s going well, until he finds out that he is the next victim of identity theft, Diana (the hilarious and charismatic Melissa McCarthy), who is living it up with his credit cards down in Winter Park, Florida. Since the cops can’t do it, he must travel from Colorado to Florida to retrieve her so he can get his life back, and all will be hunky-dory. Unexpected threats arise, and comedy and action ensue. This film follows a pretty traditional road trip formula that is structured to get asses in seats, eyes on the screen, and money in the studio’s pocket. Thankfully, it’s fairly deserving of many people’s money. It’s mostly entertaining, but sometimes predictable. It suffers many flaws on the way to the end, but it finds its way, thanks to the great comedy team that is Bateman and McCarthy. Jason Bateman plays the straight man here, lobbing up lines so the hysterical McCarthy can smash down some hysterical comebacks. A lot are aces, but some are just a little too out there, and even for a crude comedy, some of it’s a little too raunchy. The scene with her and Big Chuck is only funny because of poor Bateman hiding away in the bathroom. It’s nice that he is able to make the audience laugh a few times. The extreme crudeness is the case only on one to three occasions, but this suffers greatly from poor comedic momentum. It’s funny in the beginning, it begins to be hilarious when Bateman and McCarthy are united for the first time, and at times, five minutes go by without a joke. It forgets to make its audience to laugh, and that’s something that a comedy should promise. However, part of this is to blame on the excessive marketing campaign. If you haven’t been living under a rock since December, you would know that a good 60% of the film’s best jokes are revealed in the trailers. Thankfully, they’re still a little funny when they come around (but I go to the movies so much that I probably saw the trailer six times beforehand), and there are points in the film where some jokes are really, really funny. The big laughs are separated by some good chuckles, so that’s decent. There are also some nice surprises in this film as a whole. Diana receives a nice emotional layer added to her, as she seems to be stealing identities because she doesn’t know her own. Because of this, many might be able to relate to the material and find a solid emotional connectivity to her character. This adds a sweetness to her, and the film in general, when car chases aren’t going on. Or Diana isn’t punching 92% of the people she meets in the throat. It is also nice to see her character transformation go from antagonist to anti-hero and so forth. Back to the flaws, since many road trip concepts have been walked on before, this isn’t very original. It’s good enough entertainment, though. This film is also very crowded. There are antagonists left and right, and to make the film longer and put in more laughs, another is added to the mix. At first, Sandy is chasing Diana. Then Diana finds herself in trouble with a drug lord to whom she sold bad credit cards, and his drug dealers (Genesis Rodriguez and T.I.) come after her. Then, as a pleasant surprise, Robert “T-1000” Patrick is back in his element: chasing people. He portrays a bounty hunter who is also after Diana. Then there are cops who are also chasing Diana, and at times, Sandy. It’s a real jumbled nightmare when they are all chasing each other and when some of their paths cross. The conflicts also get solved almost too conveniently and unrealistically, so for some of it you have to turn off the logical part of your brain. I guess it’s better than having no conflict at all, like last year’s The Guilt Trip, which is almost completely bereft of conflict. Due to all the antagonists, the writing often comes off as lazy. Especially part of the haphazard ending, which makes the writer, Craig Mazin (who also wrote The Hangover Part II and Scary Movie 3), come off as completely disorganized and idiotic. He does not know whether to end it off as mean-spirited, dramatic, sweet, or hilarious, so he practically decides to do all four. In a nutshell: Despite all Identity Thief‘s flaws, it’s a funny, often charming, and fun, yet sometimes unrealistic, ride and it flows to the end fairly well. It isn’t a gem and the writing stops it from being great, but it’s still a slightly above-average comedy. By the end of 2013, many might forget about this comedy; but it is inarguably the first big comedy hit of the year, thanks to a lack of competition and a great comedy duo. Tagline: Hang on for the comedy that goes to infinity and beyond! 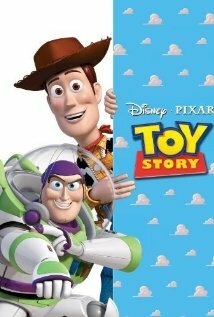 Toy Story introduced us to the magnificent world of Pixar, and its awesome CGI-animation. It’s a very cool concept that these toys come to life when Andy isn’t in the room. It raises that philosophy of: Do your toys really stay still when you’re out of the room, or do they mend relationships? It’s something awesome to believe in for the kids of the 1990s. Both the concept and premise are very fresh, and very entertaining. The toys are awesome and the voices of Woody and Buzz Lightyear have become iconic. Woody’s jealousy of Buzz cues the start of a great adventure. It also begins a great Pixar trilogy, that is soon to become a saga.